From the time of Ptolomy, men suspected the existence of a large land mass far to the south. Over the centuries, this suspicion slowly grew, until in 1773 James Cook's voyages around the continent confined any land mass to within the Antarctic Circle. Cook's discovery of thousands of seals initiated "an invasion of sealers from around the world who, migrating along the Scotia Arc, further helped to define the limits of the land mass. By 1850, a series of circumnavigations and science-based expeditions searching for the southern magnetic pole had sketched out an Antarctic perimeter. The late 19th and early part of the 20th centuries saw a series of interlinked national expeditions and became known as 'The Heroic Age'. During and after the Second World War, many nations began to take a primary interest in the Antarctic at a political level. Science programmes, especially the International Geophysical Year of 1957-1958, which established coordinated research, and the Antarctic Treaty that followed, have led to a further understanding about the Antartic and its environs. Mapping Antarctica is about the discovery and exploration of Antarctica, using contemporary maps – most very rare – to tell the story. They represent all the major events, and allow an unusual visual appreciation of change over a relatively short period of time. 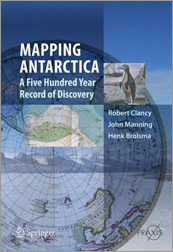 As well as enabling the wider importance of Antarctica to be recognized, the book's timeframe also allows an assessment of the changes in cartography and the shift in sophistication.